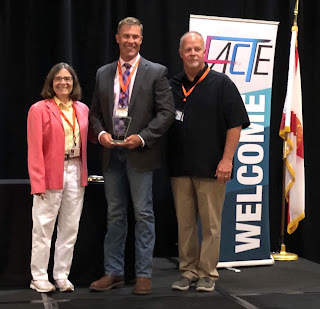 The Florida Advanced Technological Education Center (FLATE) and the Florida Association for Career and Technical Education (FACTE) awarded Electron Machine's President, C.A. Vossberg, their 2018 Distinguished Partner Manufacturing Service Award. 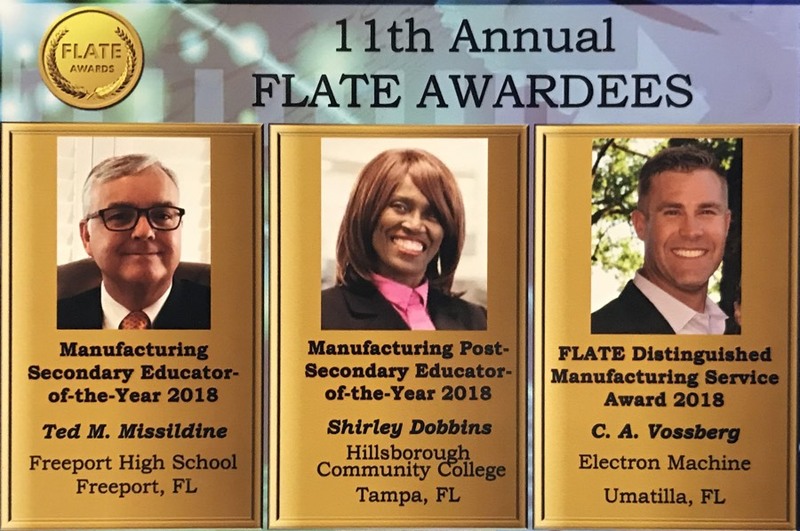 recognize leaders who have been at the forefront of manufacturing workforce education and training. This is the eleventh year of our FLATE Awards program and is one of FLATE’s many efforts to showcase and recognize the contributions of educators and industries in advancing technician education and training on a regional and statewide level. refractometers and process control equipment. For more information, contact Electron Machine by visiting https://electronmachine.com or by calling 352-669-3101. A refractometer is a process instrument capable of determining a solution's refractive index. Light bends and changes velocity as it travels from one media into another through the media interface. When light traveling through air enters liquid, the light rays change direction by an amount determined by the liquid's density. Angle of refraction refers to the magnitude the light bends as it exits one media and enters the interface of another. 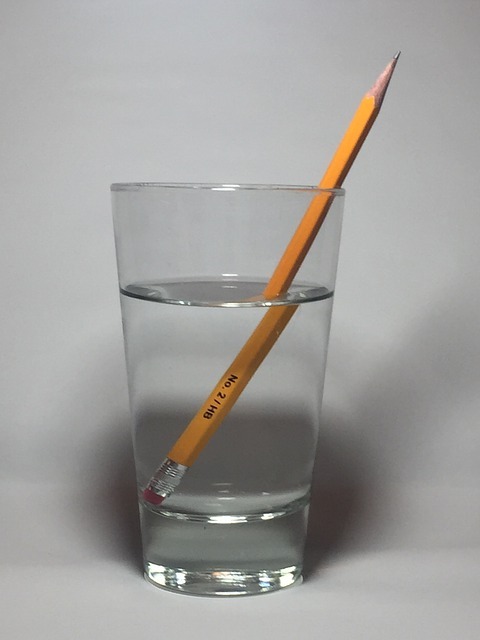 With the angle of refraction defined by their densities, different liquids display different amounts of refraction - for example, a higher density juice such as orange juice will have significantly different refraction than cranberry juice, because of its higher density. 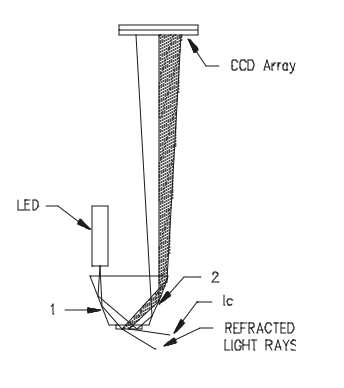 A liquid's refractive index relates to the amount of light bending that liquid displays. The greater the bending, the greater the refractive index. The lower the bending, the lower the refractive index. Standard tables are available that correlate refractive index to a variety of materials. These same tables also correlate refractive index to varying concentrations of particular liquid media at a particular temperature. Take corn syrup for example. Different refractive indexes are observed for different corn syrup samples of different concentrations. Therefore, by using a process refractometer to observe the refractive index of a particular corn syrup sample, a determination of the concentration of that particular sample can be made. By referring to the table or scale that correlates the refractive index to concentration at a particular fixed temperature, liquid concentration can be determined. The refraction index of the liquid medium readings will vary at different temperatures, and therefore, the sample's temperature must be measured and compensated for in order for refractive index readings to be accurate and repeatable. Refractive index measurements have been used for process control in the food, juice and beverage industries for decades, with the most common applications being the measurement of sugars (Brix) and total dissolved solids (TDS). Large scale production and processing of fruit juices, jams, tomato products, wine, beer, coffee, and many other products rely on industrial refractometers for quality and consistency. 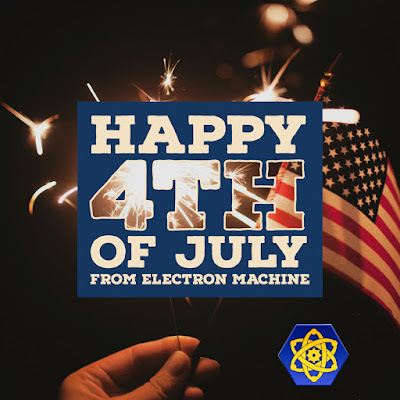 For more information contact Electron Machine Corporation by visiting https://electronmachine.com or by calling 352-669-3101. "Freedom is one of the deepest and noblest aspirations of the human spirit." 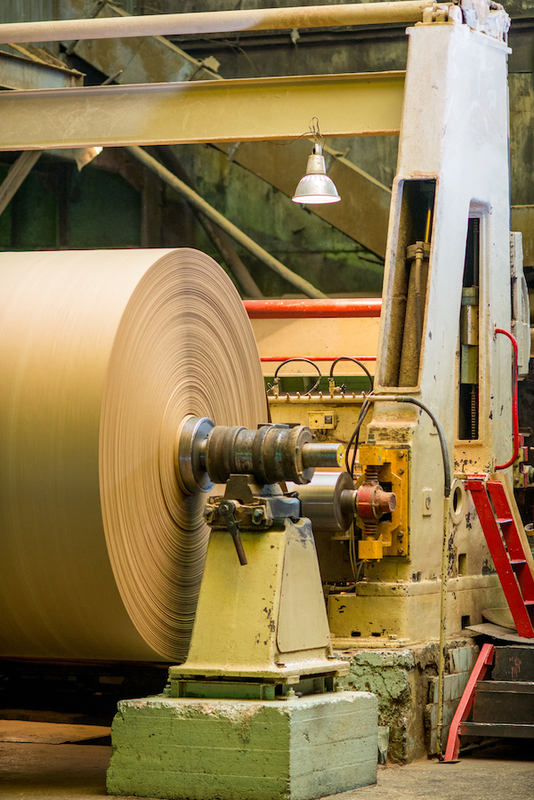 Industrial paper manufacture involves a procedure known as the Kraft process, where wood is converted into wood pulp and then into paper. The process, however, produces a toxic byproduct referred to as black liquor. This primarily liquid mixture of pulping residues (such as lignin and hemicellulose) and inorganic chemicals from the Kraft process (such as sodium hydroxide and sodium sulfide) is toxic. Until the invention of recovery boilers in the early 20th century, black liquor was often simply released into waterways. Black liquor recovery boilers allowed paper manufacturers to recover and reuse the inorganic chemicals and extract energy from the pulping residues. Reliable, continuous measurement of black liquor solids content is a subject of considerable importance to the pulp industry. The solids content of liquor introduced into a recovery furnace can have a pronounced influence on firing behavior. Current trends toward better control of the recovery furnace for reasons of safety and reduced air emissions require a greater degree of control over incoming solids content and appropriate adjustment of operating conditions to handle variations in solids content. This, in turn, requires a reliable method for continuously monitoring solids content. Instruments such as inline process refractometers successfully measuring black liquor solids concentration continuously. These instruments have the dependability, accuracy, and reliability to augment safe operation of recovery boilers. Refractive index-type instruments are more widely accepted and far more successful with less maintenance requirements than other types of instruments used for black liquor solids measurement, and have proven reliable and accurate for automatic monitoring of black liquor solids concentration. Just about every fruit harvested is processed to a concentrate. Fruit juice concentrate provides for easier transportation and longer storage life for both producers and consumers. Production technology for the juice concentration has become quite advanced, resulting in improved quality and consistency. Sweetness, color and solid components from the feedstock fruit juice carefully monitored and controlled. Fruit juice concentrate production starts with dilute juice feedstock, the application of carefully controlled heat to evaporate off water, ultimately resulting in a uniform and consistent concentrated juice. The fruit juice stock is extracted from various fruits in a number of ways that are specifically adapted for the shape, size, and nature of the fruit. It is then purified and stored in primary holding tanks. Juice concentration will vary at this initial stage due to a number of natural factors and needs to be processed to desired quality standards. One objective of the concentration process is to remove excess water in a consistent and uniform manner. Excess water removal is done through the use of specialized multi-stage evaporators that extract water without damaging the juice by applying improper amounts of heat. A closed-loop control system monitors a variety of process variables such as temperature, flow, and pressure from multiple process sensors. The readings from these sensors drive proportional outputs that modulate final control elements such as control valves. Process refractometers are sensors used at strategic points to measure dissolved solids (sugar) concentration. By monitoring and controlling percent solids and Brix, plant operators gain tighter control of product quality and more efficient use of equipment (possible energy savings). For more information on the application of process refractometers in juice and juice concentrate, contact Electron Machine Corporation by visiting https://electronmachine.com or calling 352-669-3101. From the original article titled "Electron Machine Makes Big Investment In Umatilla Future" and reprinted with permission from The North Lake Outpost, Vol. 40, No 4. 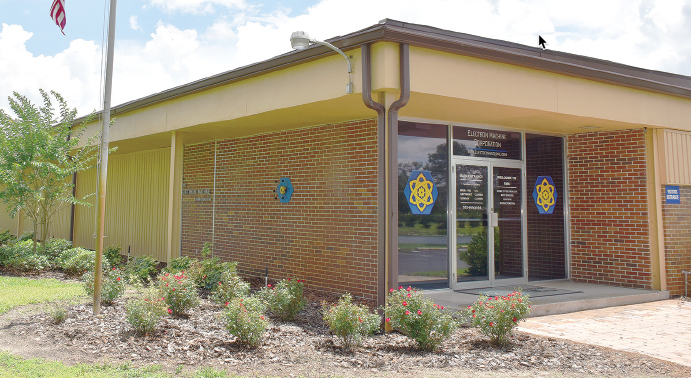 With one eye cast to preserving its deep roots in Umatilla, and another to an efficient, competitive future, the Electron Machine Corporation recently embarked on a major upgrade of its facility. 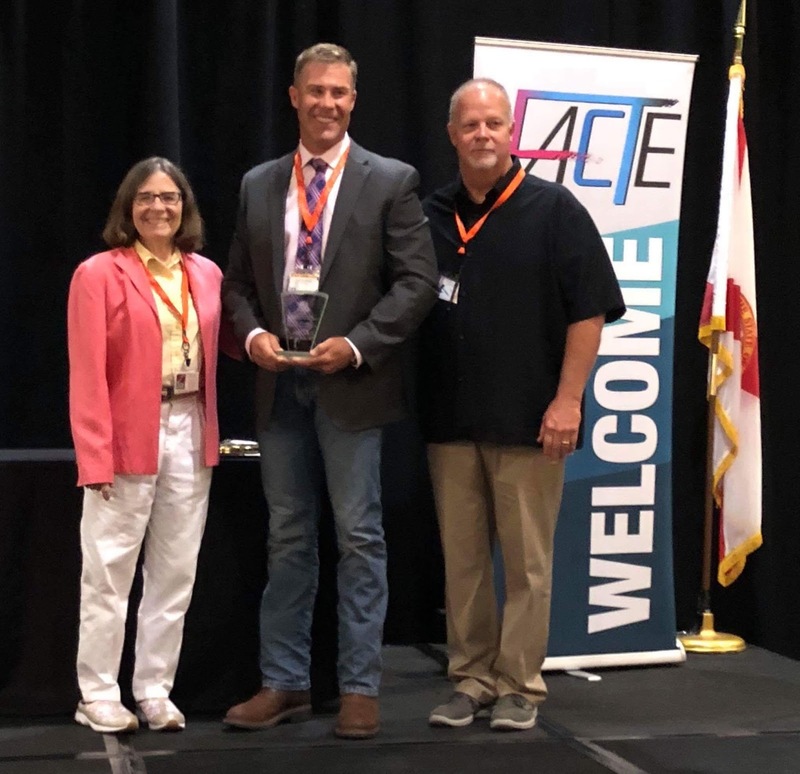 The firm, with decades of history in Umatilla manufacturing and distributing products that provide process measurement for the pulp and paper industry, the food and beverage industry, and the chemical industry, recently faced a crossroads. “We are a small firm. We have to be more nimble. We have to think differently to compete in the industries we’re serving,” said C.A. Vossberg, third generation of the Vossberg family who today oversees the firm’s operations. Facing the need to undertake major upgrades on the company’s aging 25,000 square foot building, a large portion of which isn’t fully utilized, there was discussion about where the future should be. 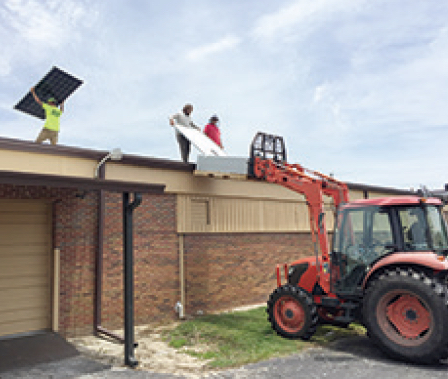 “We don’t have to have a brand new building, but we need reliability,” Vossberg said, reporting of roofing issues that were hampering operations. 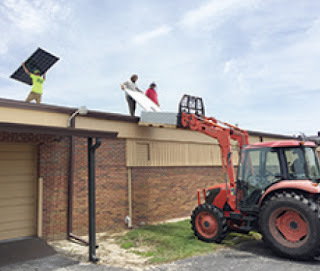 Eventually, the decision was made to fix the roof, and more. 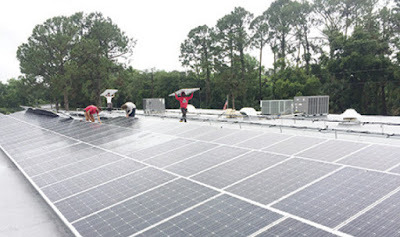 After nine months, during which countless delays brought about by Hurricane Irma made things even worse, the firm is closing in on completion of a project that features a large solar panel farm that is set to generate enough solar power to run the building. Vossberg said the idea for solar power at the plant isn’t a new one, given the building’s large, flat roof. But technology has improved to the point to make the project more viable. “The project is sized so that our net energy consumption over the year will be next to zero,” Vossberg said, a big positive when looking to the financial bottom line of operating at its current location. There is a big cost to installing such a large solar system. 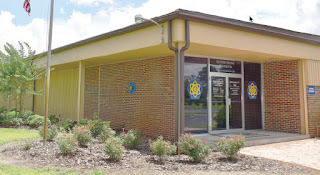 However, Electron Machine has applied for a grant through the USDA to help offset the cost. 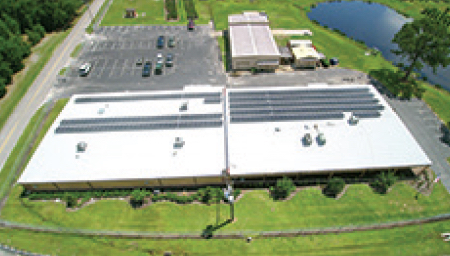 Bird's-eye view of Electron Machine's solar charged roof. Vossberg has been a proponent of rural job creation, supporting Lake Tech’s new manufacturing training facility in Eustis which is designed to increase employability in the manufacturing field, and can be found attending City of Umatilla functions regarding the Umatilla Municipal Airport. Electron Machine is among the users of the airport, and Vossberg has said it’s existence is an important cog in the wheel that allows his business to continue to function here. “Being here, it’s who we are,” Vossberg said.